Full service computer repair shop. Available Mon through Fri 10 - 6 and Sat 10 - 2. Rental Workstations available if you are visiting or without a working system. Covering all aspects of business computing. Ranging from single computers to complete server based office solutions. 40 Watt CO2 Laser Onsite. DIY Workspace with a huge catalog of tools at your disposal. 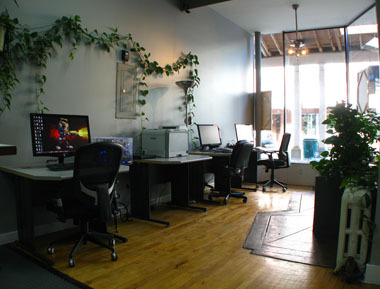 We call them Rental Workstations but you may be more familiar with the term Internet Cafe. We have multiple computers available by the hour or day. In addition to regular Web Browsing we have a special workstation set up with high end components and an extra large 27″ screen. Perfect for graphic design in a pinch. We are strictly BYOC … ‘Bring your own coffee’. The computers serve up all the applications and internet you need but we don’t serve any food or snacks. Check out Hudson Coffee Traders up the street before you drop in. (845)331-5659 | info@brainstormkingston.com | Open Monday through Friday from 10 AM to 6 PM and Saturday from 10 AM to 2 PM.